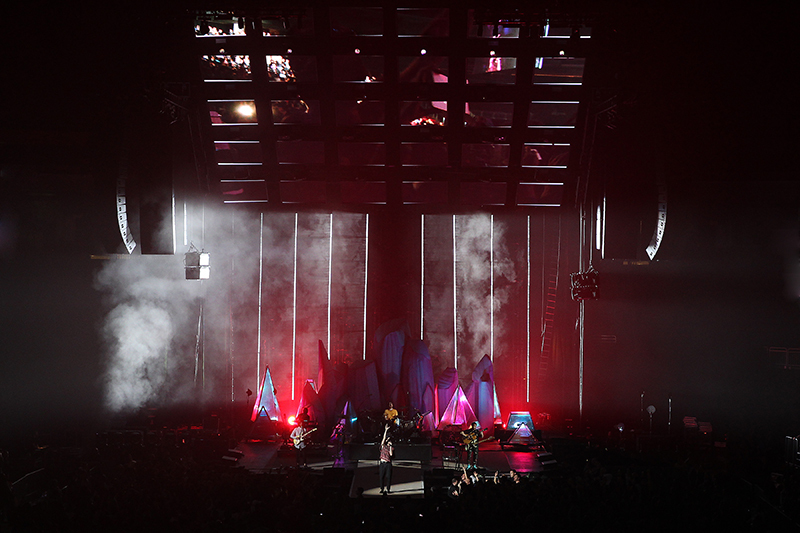 The Live Nation-produced tour is the band’s biggest to date in terms of scale and overall production value and features a unique stage design that wraps the audience around the band in a close-but-not-quite-360-degree configuration. 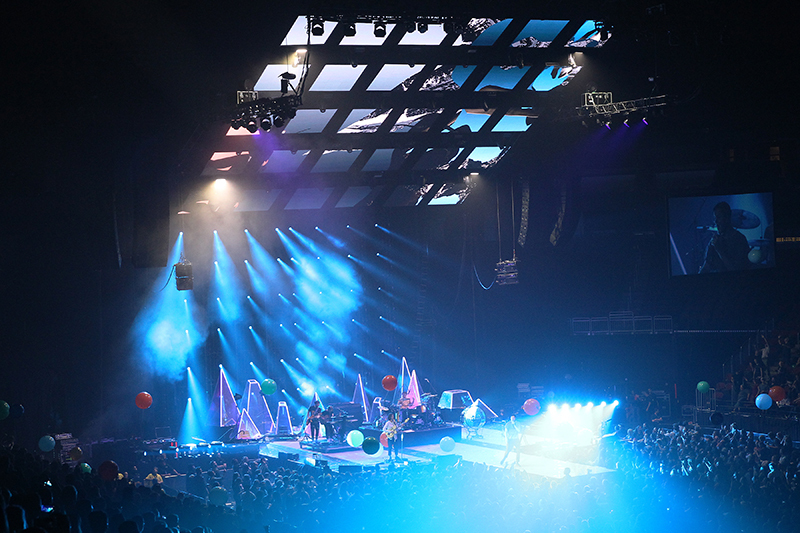 This design subsequently necessitated an equally unique audio system design with a package that, like those for all of the band’s previous production-carrying tours, was supplied by Escondido, CA-based Sound Image. 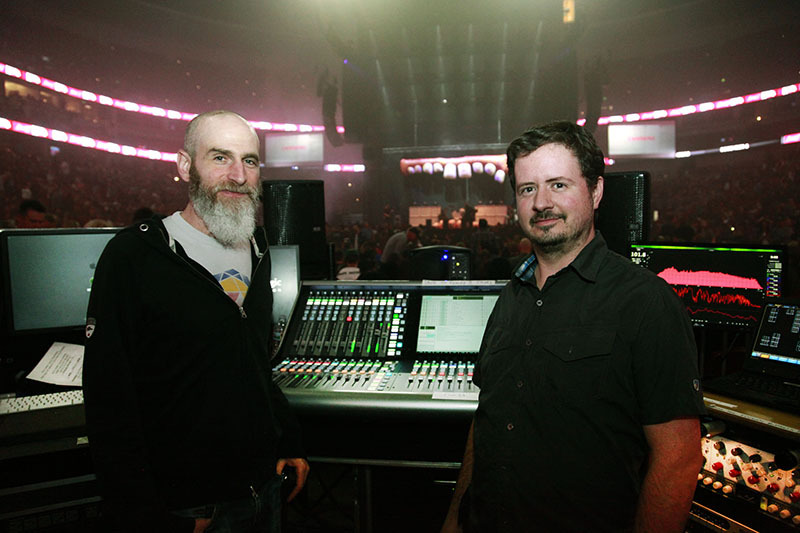 FOH engineer Scott Eisenberg has been with Imagine Dragons since 2012. 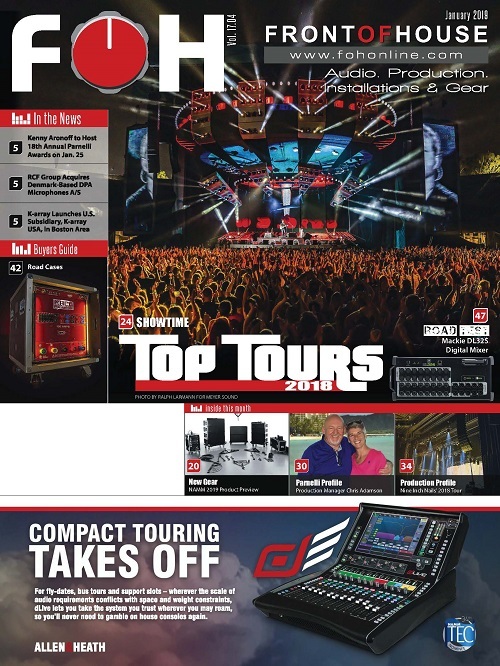 By early 2013, what began as a few months of fly dates and promo led to the band embarking on their first headlining club tour with Eisenberg pulling double duty as FOH engineer and production manager. Rounding out the package are side hangs of six E15s and nine E12 three-way enclosures per side and rear hangs of eight compact S10 two-way, full-range cabinets per side. 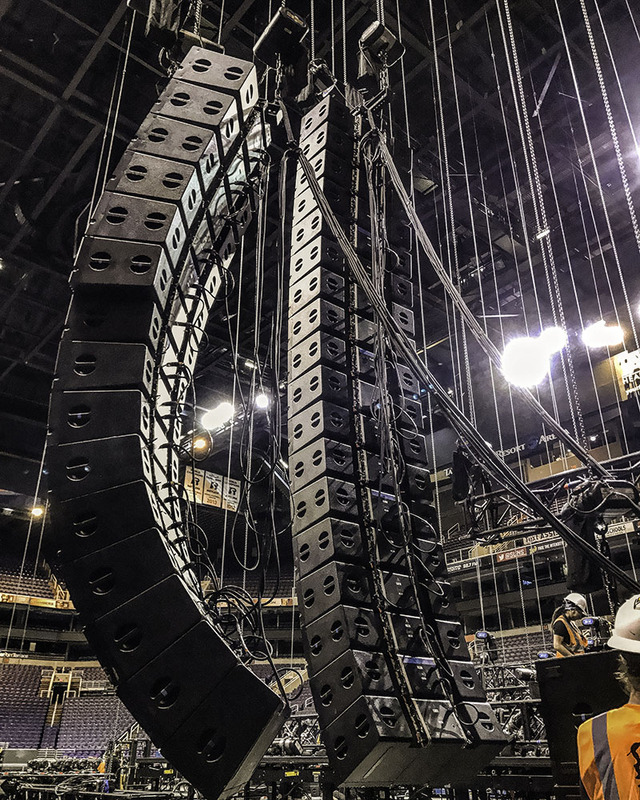 Adamson’s E219 subwoofers handle the low-end, with flown left/right arrays of 12 cabinets and an additional six per side on the ground. 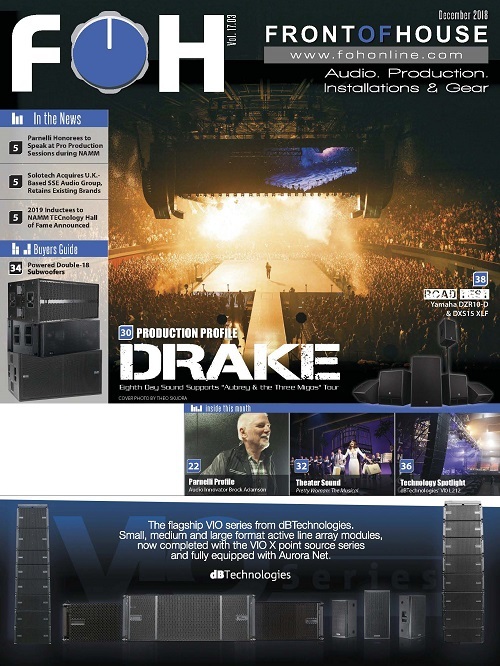 Lab.gruppen PLM20000Q amps and an LM44 digital audio system processor with Lake technology drive the system. Whaley adds that the accuracy of Adamson’s Blueprint AV prediction software has been particularly beneficial on this trek. 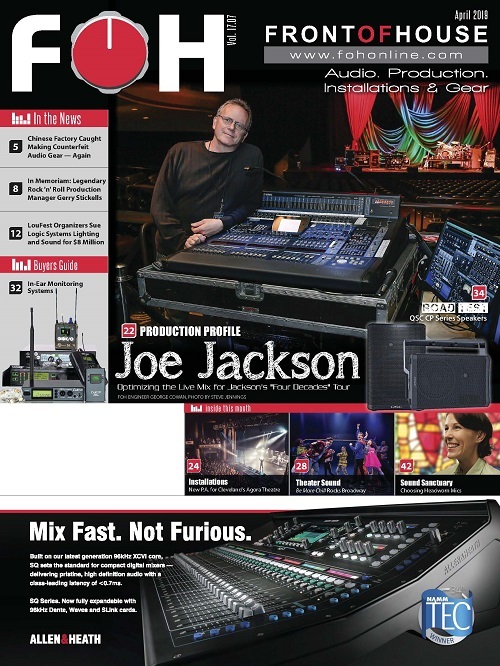 “I’m able to pretty sharply focus the mains over the stage, offering great gain before feedback with the P.A. being more upstage than usual, and we’ve had very few issues with P.A. bleed into the mics,” he notes. 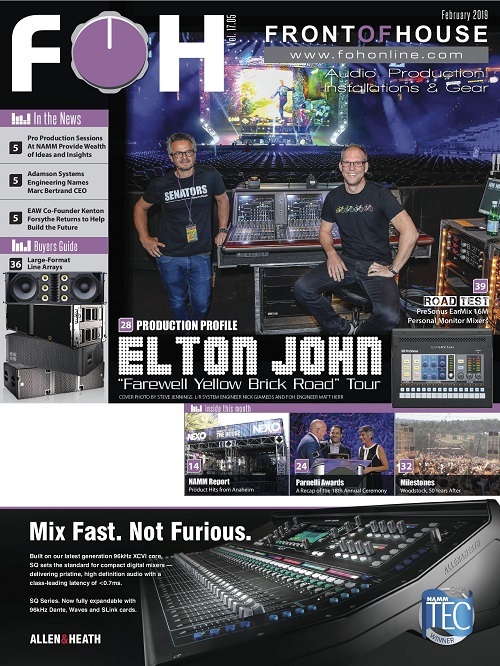 At FOH, Scott Eisenberg is mixing on a Solid State Logic L500 Plus — a relatively new entry to the world of digital mixing desks. He recalls being out on Imagine Dragons’ 2015/16 Smoke + Mirrors Tour when he first heard about the iconic recording brand pushing into the live market and was eager to hear the results. Following the trek, he visited SSL’s NYC office for a demo and spent plenty of time over the following few months exploring its features and working up a show file. “I really fell in love with it,” he recalls. “It took a little time to wrap my head around certain parts and functions, but it sounds great, is extremely flexible, and feels solid under my fingers — no pun intended.” He was confident enough to bring it out for the North American Evolve dates and says he’s been “totally happy” with its performance thus far. 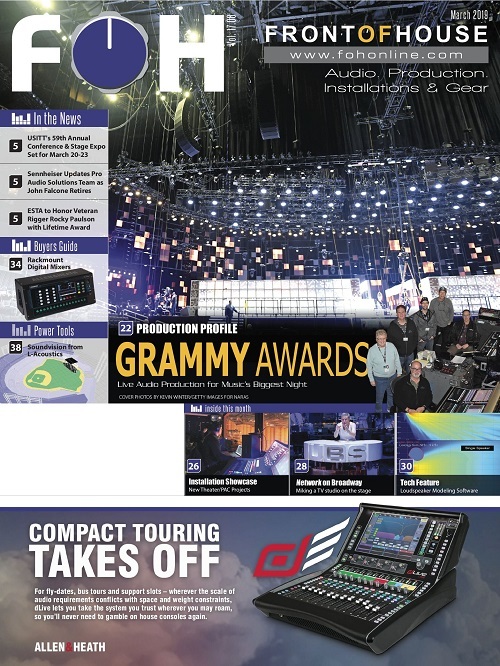 In fact, Eisenberg is so sweet on the L500 that he calls the few outboard pieces he’s carrying on the tour “kind of icing on the cake.” That said, each one does give a “special little signature” that enhances his mix. For example, he says the Neve Portico II on singer Dan Reynolds’ vocals offers a transparent EQ and compression that helps to keep his wide dynamic range in check. 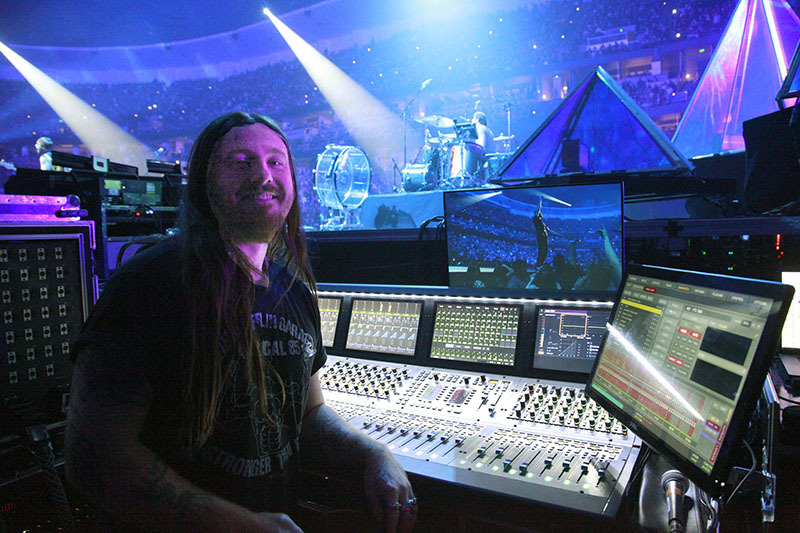 Monitor engineer Jared Swetnam mixes the band’s IEMs on an Avid S6L-32. 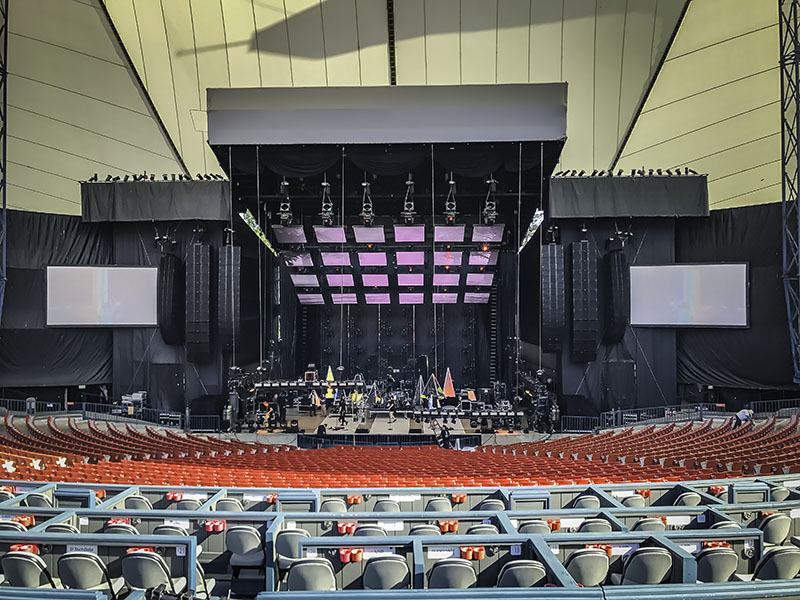 The rest of the setup is comprised heavily of Shure gear, with two channels of UHF-R on the main stage and another two on the B stage behind FOH for handhelds, plus eight channels for the band’s PSM1000 personal monitor systems. The backline uses Shure ULX-D digital wireless systems for the instrument RF. 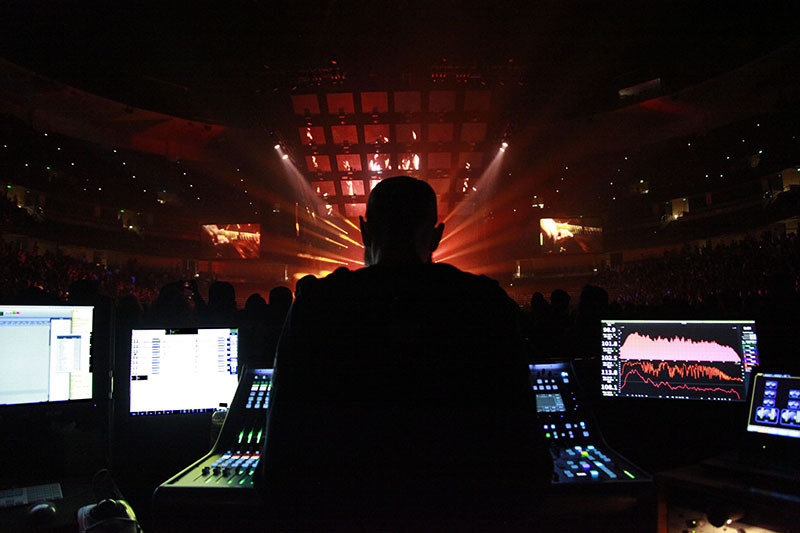 The crew on the Evolve World Tour is admittedly small for a run of this scope and scale; however, under the eye of Sound Image crew chief Brendan Hines, everyone reports a positive and productive work environment. “It truly is a team effort on this tour, and it’s a pleasure working with such a great group of guys,” shares Demonbreun. Imagine Dragons’ Evolve world tour began with a show in Phoenix, AZ on Sept. 26, 2017 and crisscrossed the U.S. and Canada until Nov. 16. The tour continues with shows in Asia (Jan. 6-17), Europe (Feb. 16 to March 4), South America (March 16-23) and Europe again (April 3-26; Aug. 16-31).